I have never been a stroller person. When we just had one kid, I think I used the stroller a total of five times. My son seemed to need to be worn all the time, was never happy unless he was pressed right up against a parent. Then, once I got large and pregnant with my second son, I bought an umbrella stroller for the big kid. And then, once I realized neither kid cared much for walking, I got a double stroller so I was pushing both my boys. Now, I’ve gone out and purchased one of those snap and go stroller frames for the bucket car seat and woah! I love it so much. I hardly recognize myself anymore. My wonderful slings woven wraps and stretchy wraps and soft-structured carriers all hang dutifully in the closet. You see, my newborn is a whopper and my body is still kind of whacked up from labor and delivery. My 13-pound 6-week-old is still too floppy for the ergonomic carriers, it’s too hot for the wraps, and the sling just isn’t cutting it for my aching hips. Babywearing isn’t working right now. But man, this stroller thing is pretty amazing! I have a hard time, obviously, with the steps at my oldest son’s school, but I love putting the bag underneath at the playground and using the cup holders for our water bottles. Plus, this whopper kid falls asleep in the car, so it’s really handy to just snap him out of the carseat base and into the stroller. Boom! Still asleep. When we’re in public, it’s hard to hold and sway my baby in just my arms, but I always have somewhere clean and safe to put him down for a minute while I push a swing or wipe a bottom. I can’t nurse while running like I can in my trusty baby carriers, but, again, I have somewhere to put the baby down so *I* can go down the twisty slide. This is my first experience with a child who sleeps and gains weight easily. I barely know how to handle myself. Many days, I phone the pediatrician to ask if it’s normal for the baby to nap for 3 hours. All of this is a reminder for me that each child truly is different and I have to use the best tools to parent each child. While my 5-year-old STILL likes it when I wear him on my back, it might just be that this young baby doesn’t need or want to be worn all the time, even when Mommy goes to the bathroom. 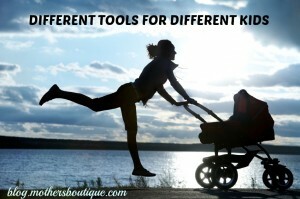 Did you find you used very different parenting strategies with your different kids? Leave us a comment to share your experience.